History, tradition, and technology. Those words could be associated with many things but arguably none more so than Japan. There’s something unique in the way Japan does things, such as blending traditional values with cutting edge technology. 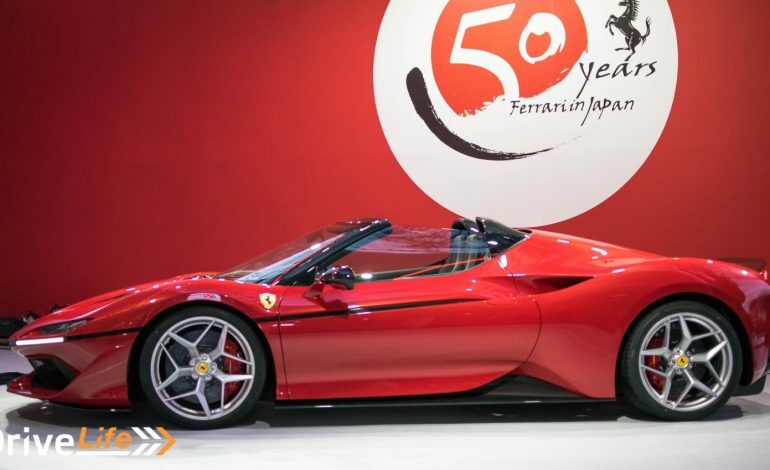 In many ways, it makes sense for Japanese people to have a passion for Ferraris. The Italian marque loves to mention its long 70 year history and tradition while pushing automotive innovation and technology forwards. 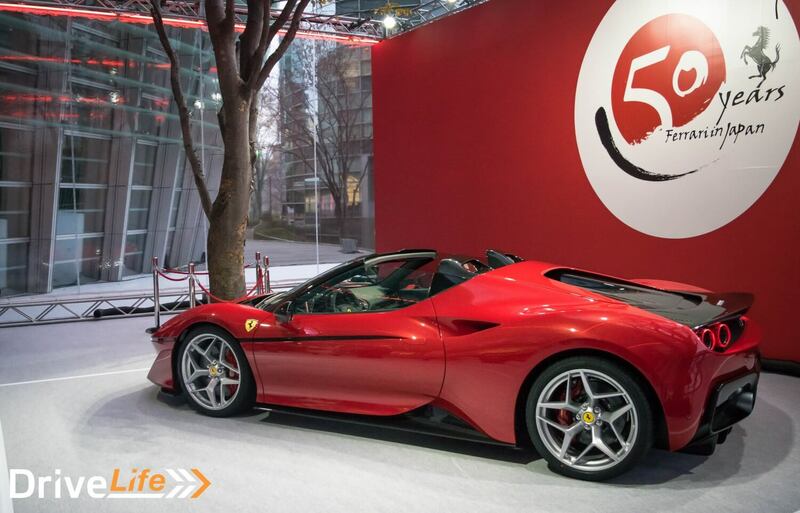 2016 marks the 50th anniversary of Ferrari in Japan and from the events they’ve held this year, you could tell they made a big deal of it. 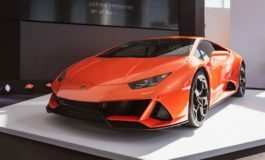 The Suzuka Racing Days, the F1 Grand Prix, the Hokkaido Rally, and of course the International Cavalcade have all been the lead up the Finale Celebration hosted yesterday at the National Art Center in Tokyo. 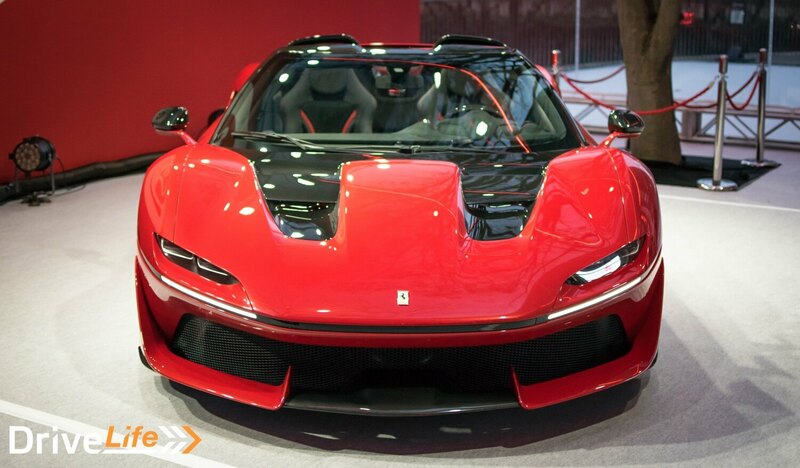 Here, Ferrari launched the J50; a car celebrating their half century in their 4th largest market. It’s the first ever dedicated model for the Japan market. With design inspired by the 308 GTS, the J50 uses the past to go into the future. 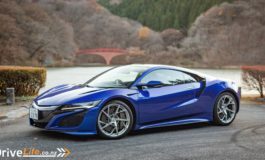 Only 10 will be made for the Japanese market. Using the current Ferrari 488 Spider as a base, the J50 is powered by Ferrari’s award winning 3.9-litre twin-turbo V8. In the J50, the engine is producing 690hp/507kW, about 30hp/22kW more than the 488. 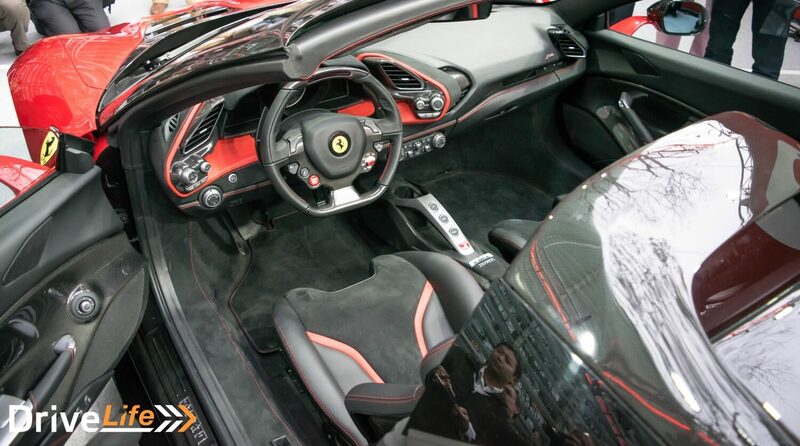 It’s the only modern V8 open-top turbocharged Ferrari with a clear engine cover. The brief was simple; “it has to come from the tradition of limited series cars, it has to link to a special and important event, it should be an exotic product not existing in the rest of the Ferrari range, and most of all it should be a completely new design”, said Enrico Galliera Senior Vice President, Commercial & Marketing of Ferrari at the press conference. Adding, “it should be non-existing in the market with a strong focus on the future and innovation”. Ferrari gave its designers a blank sheet of paper to start from. The restful is a modern, aggressive, and unique design with some nice little touches and nods to Ferraris of old. The bespoke wheel design reminds me of the F50’s, the black line that runs from the nose of the car to the side are reminiscent of the 288 GTO/F40/F50, while the quad taillight design is very 308. It also brings back the Targa body style to V8 Ferraris. The J50 comes with a removable carbon-fibre roof. No folding origami hardtop roof here. There’s a lot of carbon-fibre used in the car’s body work such as the air channels at the front, rear diffuser, and tail. I love the rear of this car especially, especially with that sculpted transparent engine cover and the roll hoops connected by the aerofoil bridge. I know its easy to get excited by a new Ferrari, but this one in particular is quite special as it has all the right homages to some of my Ferraris of yesteryear. Beauty is in the eye of the beholder, but if you don’t think the J50 is less than stunning then you’re quite wrong. And it looks even better in the metal. It’s a simpler and cleaner design than the 488 Spider. This is Ferrari doing what it does best; mixing its history with the future. The car on display was finished in a special triple-layer paint. 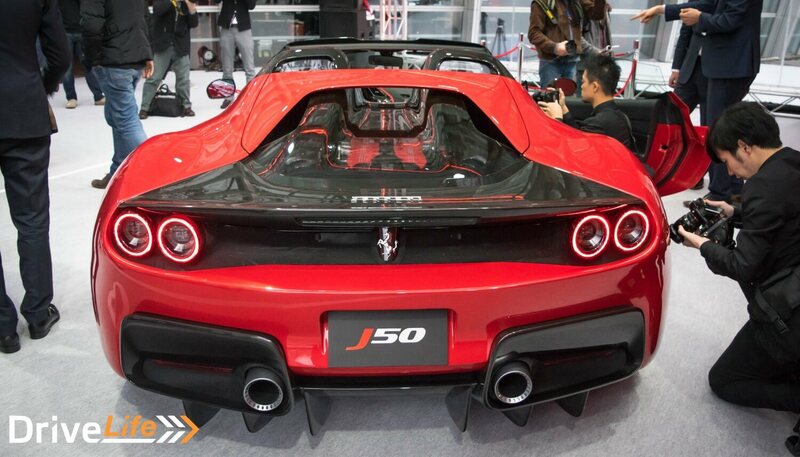 Each J50 will be made to suit each individual customer through Ferrari’s bespoke Tailor Made program. Effectively, each J50 will be a one-of-one car. Now, to understand Ferrari’s thinking with the J50 you have to look at the current market. Japan has really taken to the V8 range, especially since the new downsized turbo V8s entered the market. Ferrari claim they’ve experienced constant growth year on year in Japan and that’s thanks to those new V8 cars. Ferrari wouldn’t have done a front-engine special edition, or Fuori Serie, because there’s already the F60 America based on the F12. With the 275 being the first model in Japan it would’ve been nice to see a homage to that. But then again I would say that as the 275 is one of my all time favourite Ferrari models. All 10 units have been sold out. Prices will vary due to the Tailor Made programe but expect each customer to spend at least €2.5 million – €3 million. The first customer car is expected to be delivered by the end of 2017 with the others due in 2018. 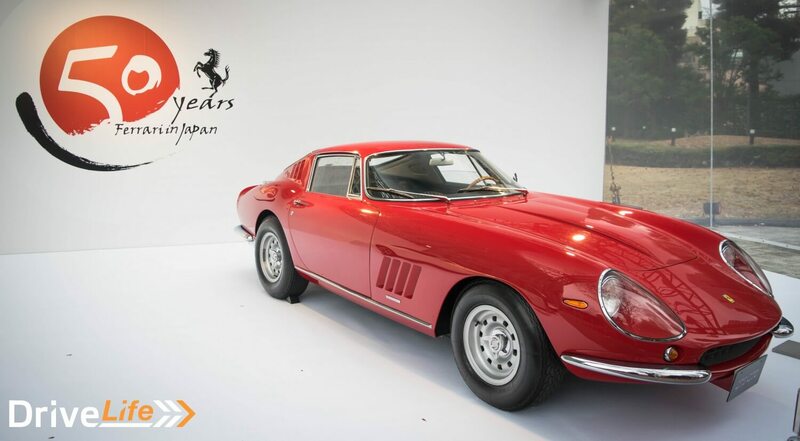 While the J50 was the star of the show, Ferrari Japan also displayed a few cars from their current stable outside the National Art Centre in Roppongi, Tokyo along with a very special guest – a 1966 Ferrari 275. The story goes, a gentleman in Japan flew over to Maranello personally, which wasn’t as easy back in 1966 as it is today, and had to buy something he believed was a work of art; the 275 GTB. Every since then, well Japan has been obsessed with the Prancing Horse. To see more of the J50 and the Ferrari 50 Year Anniversary in Japan Finale, have a look at the gallery below. 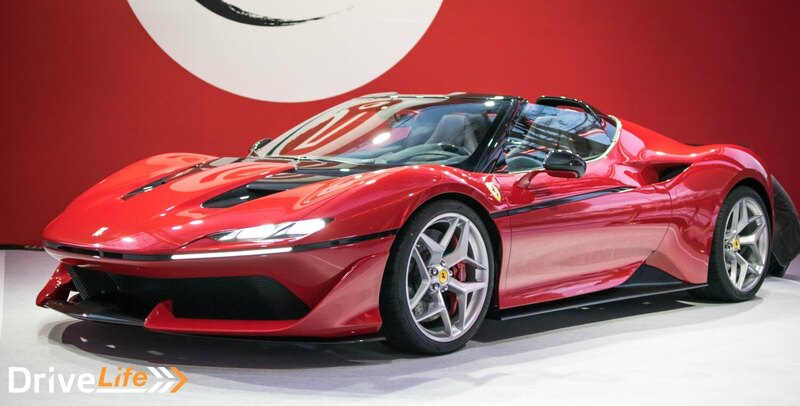 *UPDATE: Prices have been corrected to Ferrari’s estimated €2.5 million to €3 million euro ballpark figure and expected customer delivery times.